"Father have they decided yet who my new playmate is to be?" Windsor McCay isn't exactly a household name, but it should be. For nearly twenty years at the turn of the 20th century, Windsor relayed the tales of Little Nemo in a serialized, full-page weekly strip. 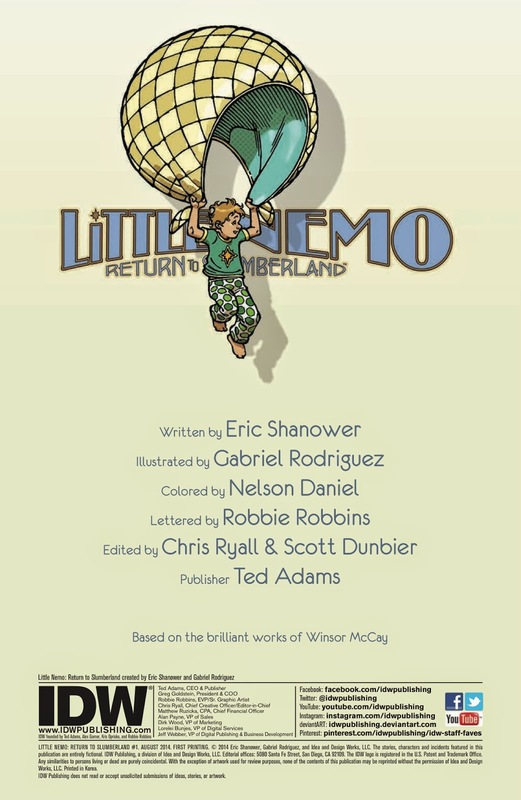 It emphasized his adventures in Slumberland, a place Nemo visited upon falling asleep. The stories were nothing short of magical and IDW is returning to Slumberland in Little Nemo: Return to Slumberland #1. The issue is written by Eric Shanower, illustrated by Gabriel Rodriguez, colored by Nelson Daniel and lettered by Robbie Robbins. King Morpheus' daughter seeks a new playmate and--in the Royal Palace of Slumberland--many names are bandied about. The name settled on is James "Jimmy" Nemo Summerton, a youth hesitant to accompany Popcorn or Bon-Bon to Slumberland because he doesn't want to play with girls. It takes a few tries, with Nemo getting closer and closer to Slumberland each night, until finally he sees what all the fuss is about. Slumberland is place that feels truly imaginative, thanks to the mythos established by Windsor but further bolstered by Shanower's brilliant script. Each night that Nemo ventures to Slumberland he gets a little bit closer, as Shanower ends each night's voyage rather climatically. 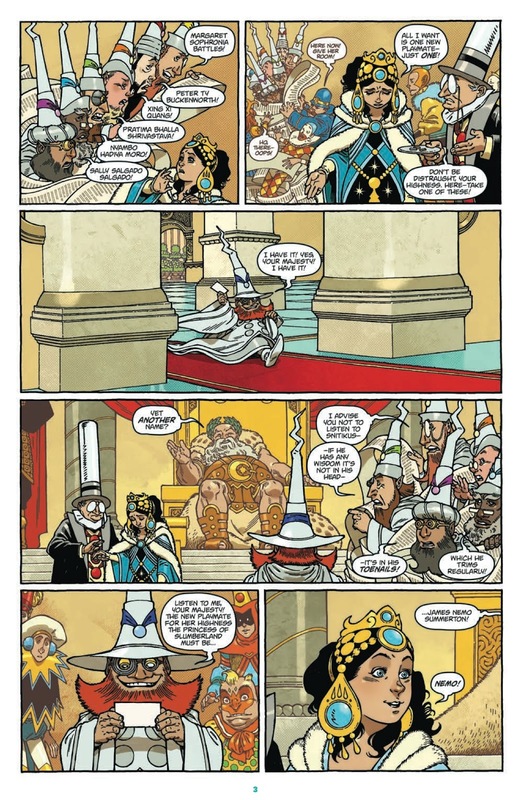 Nemo slowly comes around to the idea that Slumberland is a magical place, but Shanower brings the reader along in that realization as well through the near-misses. There's a sense of wonderment about the kingdom that Shanower deftly taps into that makes it feel like a worthy goal for both Nemo and the reader. The majesty of Slumberland is also revealed in all the near-misses, as each one demonstrates a different component of the kingdom that work together to paint a fuller picture of the world. 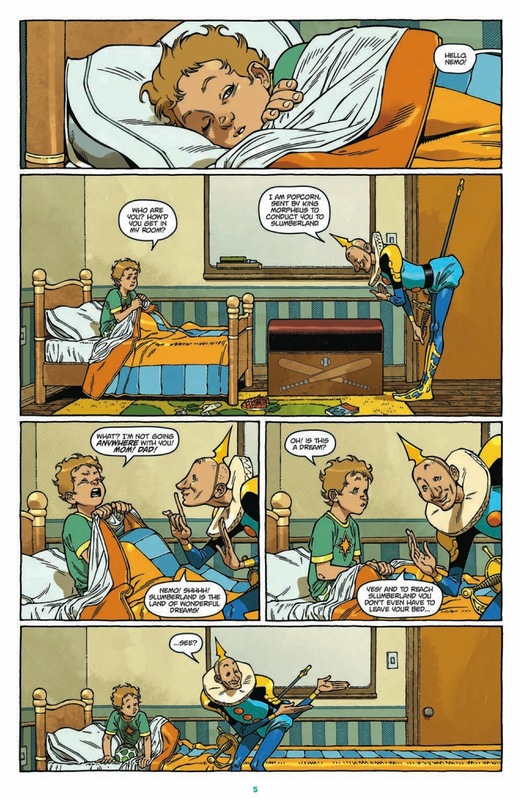 It's easy to rely on one's imagination to flesh out what Slumberland really looks like; thankfully though, Rodriguez does a phenomenal job bringing the kingdom to life. Members of Slumberland look cheerful and bold, portraying a kingdom rife with general happiness and mirth. Even the creatures who crave candy look surprisingly merry, despite their otherwise imposing size. Bon-Bon and Popcorn evoke a sense of childish amusement in the reader that's perfectly befitting of Nemo's attempts to reach Slumberland. 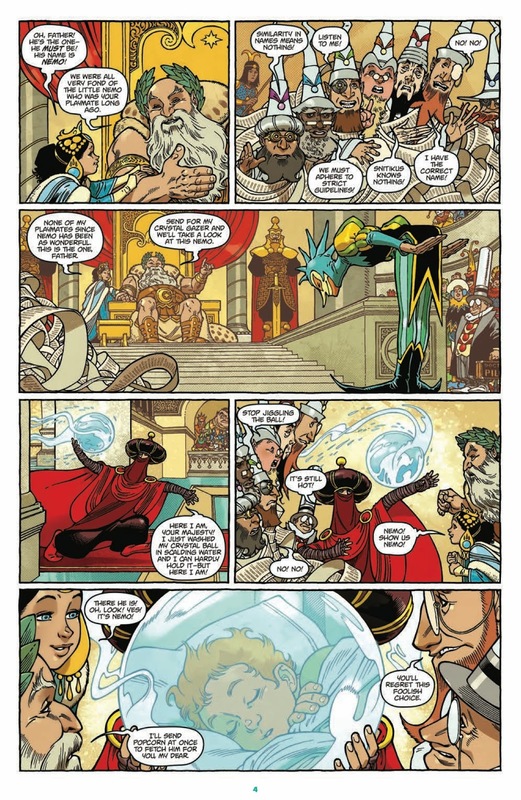 There's a youthful sensibility to the art that keeps the reader engaged in their imagination, really helping them feel as if they're traveling alongside Nemo to the realm of Slumberland. 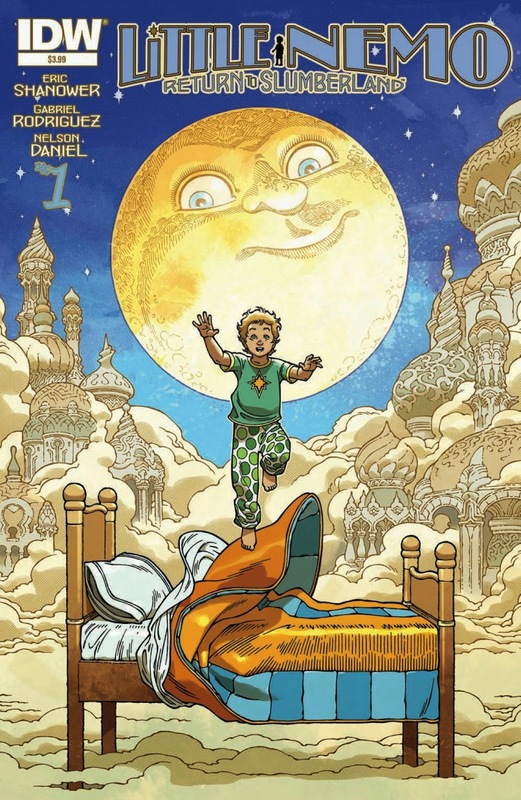 Little Nemo: Return to Slumberland #1 is a very endearing first issue that hits all the right notes when it comes to the character and the adventures in Slumberland. Nemo is reluctant at first when presented with the opportunity, but he gradually comes around in a way that feels genuinely curious. Shanower does a marvelous job capturing that curiosity and slowly peeling back the curtain on it for both Nemo and the reader, revealing more and more wonder with each page. Rodriguez's illustrations are very imaginative and do a great job capturing the essence of Slumberland and curiosity. 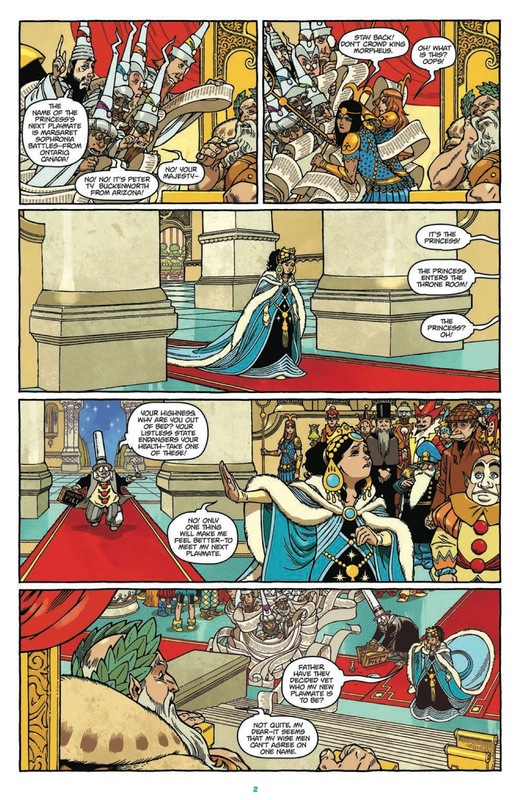 Little Nemo: Return to Slumberland #1 is a very charming book that's enthusiastic about the subject material and looks to be the start of something exciting. 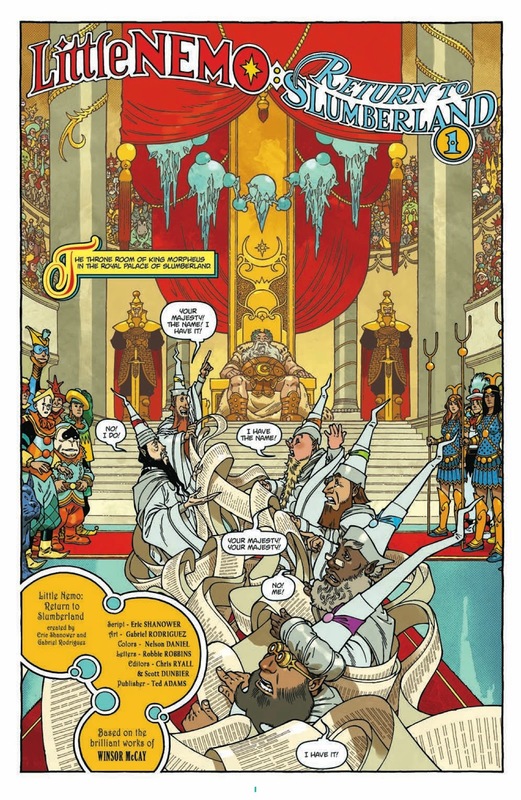 Little Nemo: Return to Slumberland #1 is in stores now with interiors below.